Info "Drop the trap from above and catch the mouse!" Mouse Trap is a microgame found in the Nature folder in WarioWare, Inc.: Mega Microgame$!. 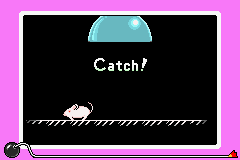 There is a mouse that runs side to side and the player must drop the trap dome when the mouse is directly under it. 1st level difficulty: The dome is very wide. It's 4/4 in diameter taking up nearly a third of the in-game screen's width. 2nd level difficulty: The dome is 3/4 in diameter. 3rd level difficulty: The dome is 2/4 or 1/2 in diameter, making it very hard to trap the mouse. This page was last edited on January 4, 2019, at 16:27.